The last thing I want to show you in my gallery is my longarm quilting machine. 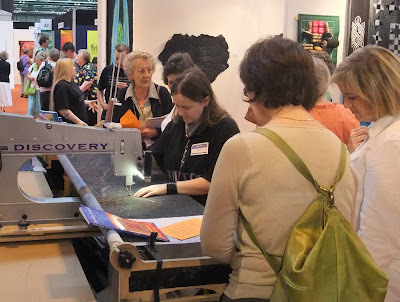 From talking to people who were at the show a lot of quilters haven't ever seen one in action. I would think that goes double for the non-quilters amongst my readers. Fortunately Tet managed to video me demonstrating while I wasn't looking. I don't like cameras much and video cameras are even worse. It's not a very long video, but rest assured more are planned. I am hoping we might manage to video some of the quilting of the holiday quilt, given I am having to get used to being filmed I might as well make use of it. 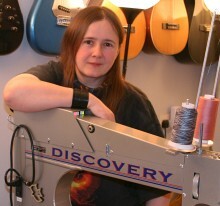 Hopefully Twisted Thread will soon be putting up some footage of me quilting that I will be able to share. It was taken by their professional photographer who was very good at putting me at ease. Anyway enough about video, back to the longarm. I work on an APQS Discovery, mounted on a Hinterburg quilt frame. I would love to have the correct frame for the machine but my house isn't wide enough to fit one in. I used cotton threads on it for nearly all my quilts. I do sometimes branch out into metallic threads, but not often. My quilting is done free hand, which means I don't have a pattern I am following, I just draw with the machine. On a pieced quilt I can used the patterns within the top to help guide my placement, but with the wholecloth quilts that are quilted to look pieced I do mark the piecing lines before I quilt. I do not have a computer on my machine, I can't just program it to do something. Really all the machine does is move the needle up and down. I can control the speed the needle moves, but everything else is down to how I move the machine, including the stitch length. Yes a lot of longarm quilters do have computers and stitch regulators, I choose not to. I like being able to shift a pattern slightly to make it work to best effect. Sometimes this means blending it into the piecing, other times I may make sure the fancy part of a design is somewhere it shows more, it depends on what the quilt needs. On the test piece I was making (which is likely to actually get used) I was trying to create a crazy patchwork look. I thought this would give me a chance to make an interesting piece of quilting but allow me to change designs regularly and even take requests from visitors. I felt it worked really well as people did pop back from time to time to see what new patterns I had added. If you are interested in me quilting your quilts for you please get in touch. I will take quilts in my post and I am quite happy to discuss possible designs by email. You can also get a quote based on the size of your quilt directly from my web site, here. Next to the longarm we had the merchandise table. I was going to say sales table but I think the free pencils and flying saucers were at least as popular as anything for sale. I'm sorry I can't supply flying saucers to you all over the Internet. I do send out pencils with any order where it doesn't add to the postage though. Apparently my pencils are very good for doing the crossword. I don't do them myself so I don't know what makes a pencil particularly good for that but I've been told it enough to believe it is true. As you can see in the photograph the book got a lot of attention, even though most of the time I was so busy with the machine I didn't notice it. I now have the postcard packs, books and patterns for sale on my site too. So you don't have to miss out on the souvenirs, they can be found here, along with the book behind the quilt 'Bad Rain'. I hope you have enjoyed your tour. I've really appreciated hearing from so many of you. I would love to take these quilts to more shows, so if you know of one that might be interested please do get in touch. I have plans to try and get some of them into quilt competitions around the world and I am sure you will be able to follow their success or failure here. We are still working on the rest of the videos so check back soon and hopefully I will be able to give you a more dynamic look at my quilts. 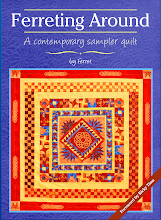 VBG, yes, a DVD of you quilting would be ideal for quilting relaxation! * Maybe a machine quilting book & DVD next? Your stand at the NEC was just wonderful. Seeing all the quilts in the flesh was fantastic. They look even better than the pictures and the pictures are pretty fab! Boy you were busy though!!!! You were by far the busiest stand. The husband was really impressed with everything. He loved See Sound as I'd expected and Bad Rain but his favourites were the leather ones. They were pretty damn fabulous though. 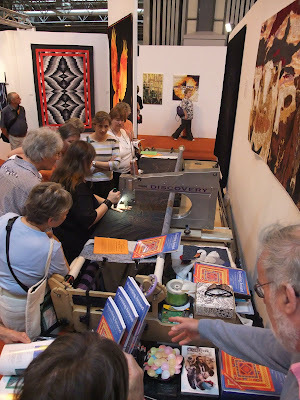 Thanks for the tour of your gallery and I loved the wee video showing you quilting on your longarm. Good luck with your quilts in upcoming shows, they are fabulous.